If quirky modern is your aesthetic style then we have a nursery furniture brand just for you! 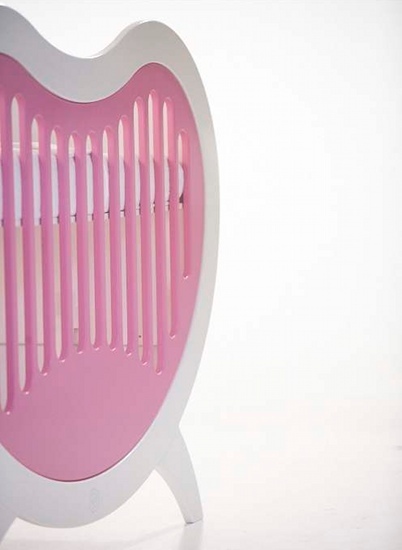 Employing organic forms, Beaneasy has created the bee’s knees of furniture with an offbeat edge. The cot and change table resemble beans and the wardrobe, the inside of an apple! Miffy lovers can also rejoice as there is a special nursery set imprinted with Miffy’s adorable image. We first showed you this delightful furniture during our coverage of the Kind + Jugend trade show in Germany back in September and we thought the brand deserved some individual attention from Babyology. The range is unique not only for the shapes it makes in the nursery but also for the fact that you can choose from nine accent colours. 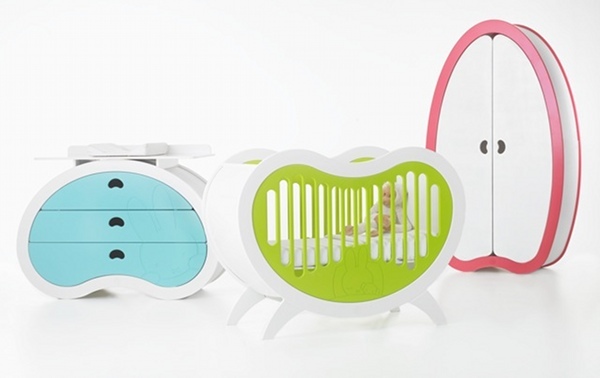 The Dream cot’s side panel can be green, pink, red, aqua, teal, yellow, orange, white or taupe. The same nine colours can also be applied to the drawers of the Hug change table and edges of the Hide wardrobe. Don’t like any of those and want a custom colour? No problem – Beaneasy will make it in your desired shade for a fee. Want to mix and match panels? Beaneasy will also make extra colours so you can change the look of the cot as you please. Australians are coming to expect that all the fabulous products in the world be attainable, even when we live so far away. Sometimes we have to bring you brands that aren’t available here yet, which can be frustrating for stylish parents who simply must have the object they love so much. We’re thrilled to tell you that Beaneasy will ship all over the world – this is one flexible company! The Dream cot converts to AUD$1600, the Hug change table $2250 and the Hide wardrobe about $1900 plus shipping, from Beaneasy.